Description: Organize your cellar or wine rack…or personalize your wine gifts! Hang these personalized tags on wine bottles in your cellar or wine rack and easily find the wine you are looking for — no need to pull out every bottle! Or — use them to decorate any bottle you give as a gift! 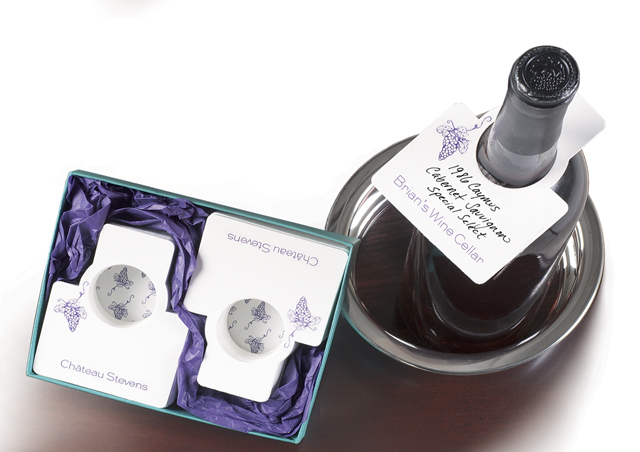 Printed on thick paper stock, these tags will help organize any size wine collection. 50 Tags come in an attractive gift box with a clear lid. Personalization available in violet ink only. Type style as shown only. Specify any phrase or name exactly as you want it printed. (Limit 24 characters including spaces).Tags measure approximately 3" x 3 3/4".